ADXL is an accelerometer sensor used to take a signal based on human gestures, it needs a calibration to adjust in order to get a signal from sensor for different motions. In this article we are going to discuss about calibration process using 8051 microcontroller. In 8051/52 architecture doesn’t have Analog to Digital converter, so need to interface an ADC feature to your circuit. 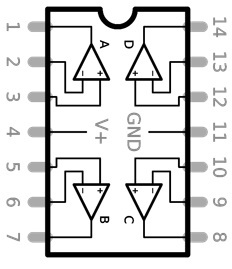 LM324 is an OpAmp based comparator IC, which can convert analog voltage to digital. LM324 has four OpAmp, so that this IC can able to convert signals from four sensors. OpAmp has two input pins – Inverting Pin (-) and Non Inverting Pin (+). 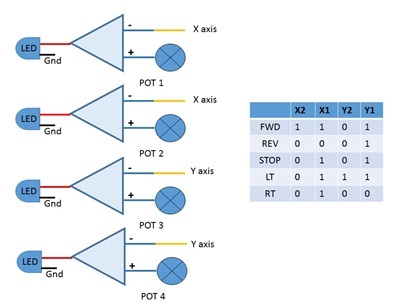 Where Signal of ADXL sensor have to connect with Inverting Pin and a Potentiometer with Non Inverting pin to set a reference voltage. Connect ADXL X axis pin with OpAmp 3,4 and Y axis to OpAmp 1 and 2. Hold the sensor in straight position and calibrate for that condition as 0101 using POT and LED’s. Once this calibration is done, you can get the values for other movements also. What is IoT? How it works? Internet of Things, in short IoT, is an upcoming technology that transforms the everyday objects into an ecosystem that would enrich our lives and make it simpler. IoT is the latest technology that can transform any electronic device into a smarter one. IoT uses the power of data and provides valuable insights to the users which can be used to improve operational efficiency and productivity. From washing machines, ventilators, TV systems to vehicle garage, everything can be transformed into a smarter device with the help of IoT. IoT technology is bringing a large number of day-to-day objects into the digital fold to make us live our lives smarter and efficient. WiFi Module: This facilitates the connection between the device and the cloud platform. The data will be sent to the cloud platform with the help of this module. The most commonly used WiFi module is ESP-8266. Since Raspberry Pi has an inbuilt WiFi module, you don't require an additional one to establish the connection. Cloud Platform: The feature that differentiates IoT from other technologies is the way the data is handled. IoT facilitates the transfer of data onto the cloud for storage and analysis with ease. For this, you need to link the project with any cloud platform. ThinkSpeak IoT platform is the most commonly used cloud platform. Actuators: These are the devices that perform a specific action upon receiving the commands from the microcontroller. Actuators like water pump, relay driver modules, DC motors to carry out variations actuations like irrigating a field, switching ON/OFF of devices etc upon programming. What is a IoT based Project? IoT, Internet of Things is transforming the way we live our lives. From homes, offices, streets to cities, everything is being transformed to become smarter. Even the simplest electronics devices are being made smarter by integrating them with IoT. Since IoT enables the data transfer to cloud, the technology provides valuable insights to make the devices more efficient and productive. In short, IOT is an integrated technology that offers a platform where the large amounts of data collected from various resources can be stored and analysed. This is highly important for industries to implement onto their operations as it greatly assists them to make right and efficient decisions. IoT technology requires a microcontroller to process the data, WiFi integration to send data to the cloud and actuators to control operations. The data collected and sent will be stored in cloud platform for later analysis. This data can be accessed by any user from any part of the world to get valuable insights.